A friend of mine recently reminded me about this recipe. I made these cookies many times quite a few years ago. But I forgot about the recipe and had not made them in a long time. I decided to give them a try again. I can’t believe I forgot about this recipe, they are so good. This is an old Taste of Home recipe. 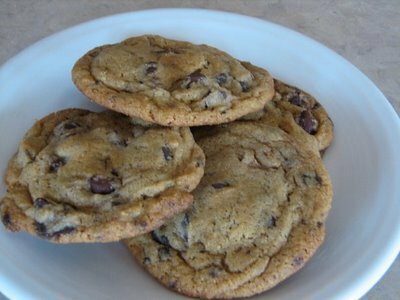 They are one of my husband’s favorite chocolate cookies, which is why I should have never forgotten about this recipe. They are not healthy and they contain a few odd ingredients like malted milk powder. But if you like the flavor of malt you will love these cookies. They are really good. In a large mixing bowl, beat the shortening, brown sugar, malted milk powder, chocolate syrup and vanilla for 2 minutes. Add egg. Combine the flour, baking soda and salt; gradually add to creamed mixture, mixing well after each addition. Stir in chocolate chunks and chips. Shape into 2-in. balls; place 3 in. apart on ungreased baking sheets. Bake at 375° for 12-14 minutes or until golden brown. Cool for 2 minutes before removing to a wire rack. Your cookies sound and look yummy. Thanks for the recipe. I love the flavor of malted milk! I hadn’t thought of putting malted milk in cookies, I bet they are delicious. I will have to try it next time I make chocolate chip cookies for the gang. Thanks for stopping by my site. First question: how could you forget about these cookies? Second question: do you think it would be ok to substitute butter in place of the shortening? Hello YUMMY! Thanks for the recipe! Courtney, I thought the same thing when I made the recently. I really do not use much crisco. I am not sure. Some recipes you can and some you can’t. Next time I make them I think I will use 1/2 butter and see what happens. If that works then I might try all butter. If you try all butter let me know how it works. Sounds wonderful, as always. Thank you, Lynn. Wow! I love malts so I bet I would love these. Thanks for the recipe. I have a canister of malted milk powder leftover from another recipe and was wondering how to use it up. Thanks for posting this recipe. Do you think it would work with other flavor baking chips? Also, what other ways do you use malted milk powder? Annie, I think malt and choc. would be the best combo but you could try white choc. I really don’t use malt in anything else. The only recipe I use it in is this one. What other recipe did you use it for? I would love to have something else to use up the jar. Lynn, these cookies sound amazing! What a great idea to put malted milk powder in them. Yum!